Be the first to share your favorite memory, photo or story of Vella. This memorial page is dedicated for family, friends and future generations to celebrate the life of their loved one. 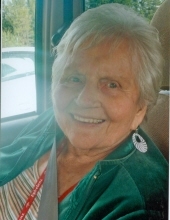 Brookings resident Vella Mae Stover passed away on April 4, 2019 at Sea View Senior Living Community in Brookings. She was 95 years old. Vella was born in Wichita, Kansas no January 28, 1924 to Glen Olin Snyder and Hazel Frances (Crane) Snyder. She married John Harvey Stover Jr. on January 1, 1946. He passed away July 6, 2005. She is survived by two sons: Robert and John Stover of Brookings, a grandson Kevin Stover of Santa Cruz, California and a granddaughter Christy Alvino of Massachusetts. A Memorial Service will be held at 1:00 p.m. on Saturday April 13, 2019 at Redwood Memorial Chapel, 1020 Fifield Street, Brookings. Vella’s family would like to thank the staff at Sea View Senior Living Community for their compassionate and loving support. Redwood Memorial Chapel is assisting the family. To send flowers or a remembrance gift to the family of Vella Mae Stover, please visit our Tribute Store. "Email Address" would like to share the life celebration of Vella Mae Stover. Click on the "link" to go to share a favorite memory or leave a condolence message for the family.